There was possibly an Anglo-Saxon Church on this site but there’s no conclusive evidence to substantiate this. 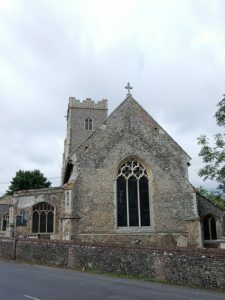 Badwell Ash Church is not mentioned in the Domesday Survey of 1086 but 2 churches are mentioned at Great Ashfield – was one of these for Badwell Ash? The village was originally “Parva Asshefelde” and the name changed to Badwell Ash in the C14. The Chancel is the oldest part of the church and was probably built in the first half of the C14 during the reigns of Edward II or III (1312 -1377). In 1358, during the reign of Edward III, the church was in the ownership of the Canons of Ixworth Priory. In 1291, The Priory had an income of £81 17s 11 ½ d, (or £60,000 p.a. in today’s money) from 12 parishes, including Badwell Ash. During the late C14/early C15, in the reign of Richard II 1377-1399, the Chancel was heightened. 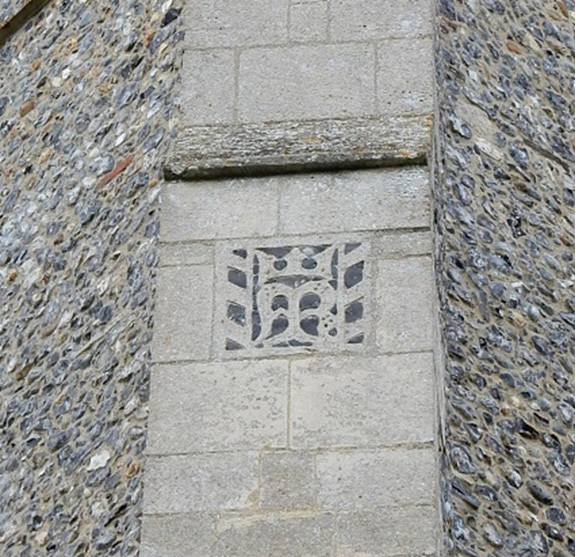 Evidence for this can be seen from the change in the flintwork in the Eastern end of the church and the “putlog” holes in that wall built to support the scaffolding. 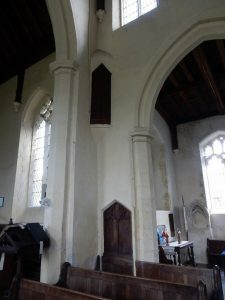 Photo – The Chancel, south side, showing the filled “putlog” holes. 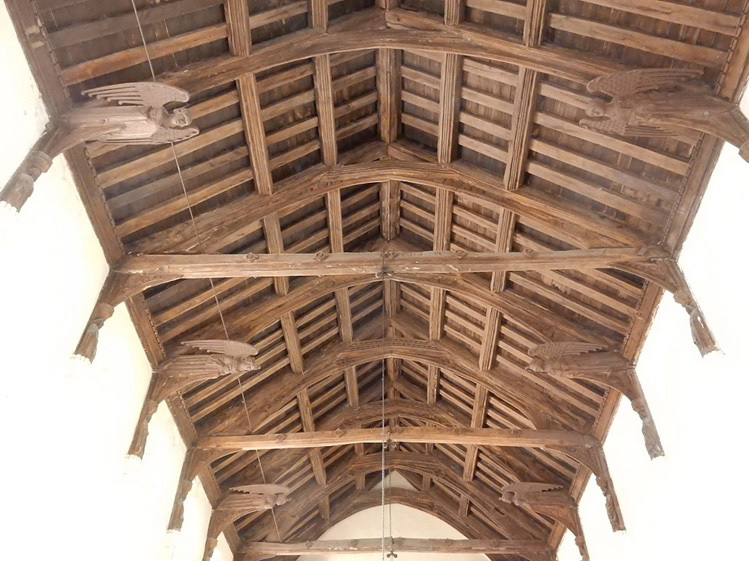 The Nave was probably built towards the end of the C14/early C15 and still has its original medieval roof structure although this was strengthened in 1703 with tie beams and again in 1849. Each tie beam has the name of the Churchwardens written on them. The angels on the hammer beams were extensively restored in C19. 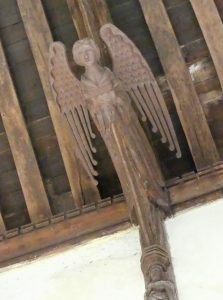 It seems that other angels may have been removed in 1703 to install the tie beams. The South Aisle was constructed in the late C14 when the Clerestory Windows were inserted in The Nave to allow light in. The Tower, which is 23m (76’0”) high, was built in the late C15, probably in the decade after 1476. It was built by a master mason from North Lopham, Thomas Aldrych. 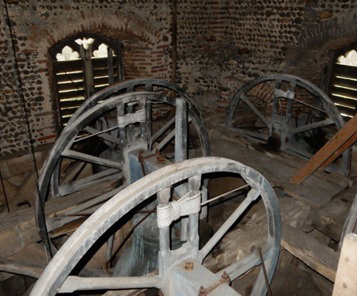 The Bell Chamber contains 5 bells, 3 of which were all cast in Thetford in 1630 during the reign of Charles I, 1625 – 1649. One was cast in Ipswich in 1664 and the largest weighing 13cwt was cast in Clerkenwell in 1899. The Bell Frame is made of oak and is C15, although it was extensively restored in 1899 by George Day of Eye. 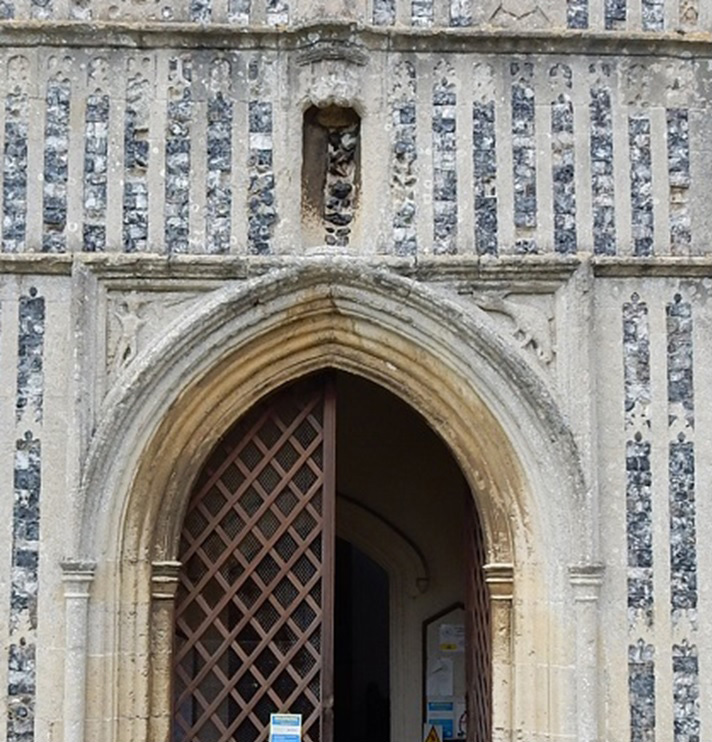 The South Porch was added at about the same time as the Tower and both were built by Thomas Aldrych. 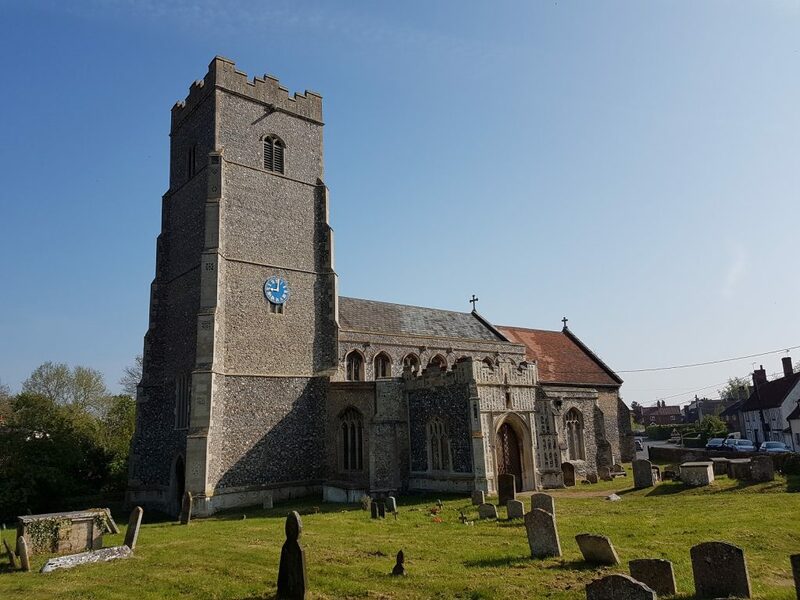 Locally, the Aldrych family built church towers at Elmswell, Ixworth, Rougham and Mendelsham as well as several others in both Norfolk and Suffolk. The clerestories at Walsham le Willows, Woolpit, Bacton, Redgrave are Wortham are all stylistically similar to Badwell Ash indicating that they were also probably built by the Aldrych family. 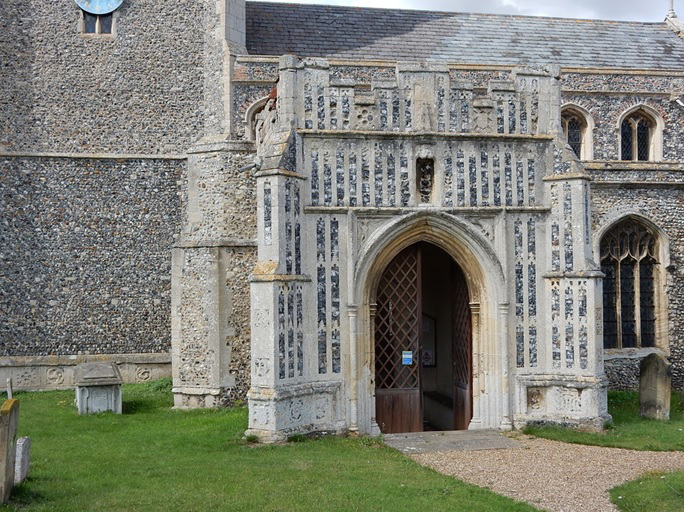 St Mary’s contains some of the finest flint flushwork panels from any church in East Anglia. 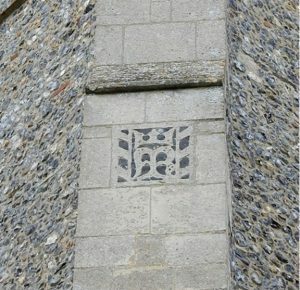 Flushwork is described as the combination on the same flat plane of flint and ashlar stone and usually depicts religious emblems. There are a total of 76 flushwork panels throughout the church with 33 located on the South Porch. Many of these panels have become over the years so weathered and disfigured as to be almost illegible today. Many have also lost their meaning to 21st century man as they were intended to educate the illiterate medieval man and woman about the wonders of the Christian religion. 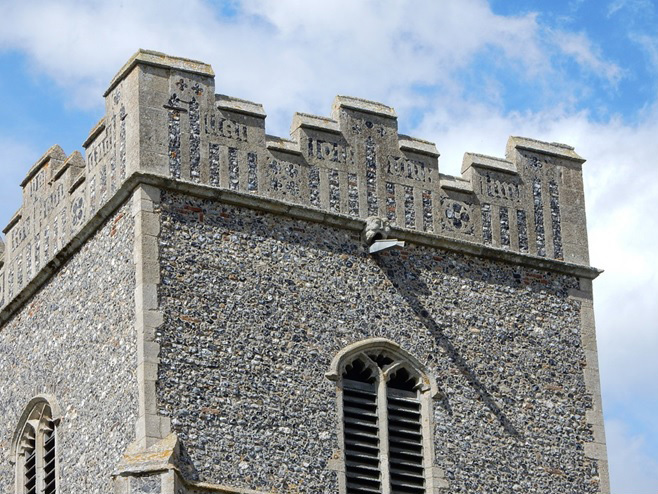 There’s an inscription in flint flushwork which runs all the way round the top of the Tower which reads “Pray for the god estate of ion finchom and Margyt his wyf”. 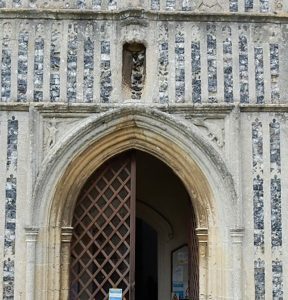 On the front of the South Porch either side of the arch are two carvings. It’s always been believed that these two carvings are of St George and the Dragon but, as the church was originally dedicated as “All Saints” and St Michael was the leader of the Saints, it’s now felt that these carvings represent St Michael and a Dragon (“And war broke out in heaven; Michael and his angels fought against the dragon”. Revelations 12.7). Photo – The two South Porch carvings either side of the arch. 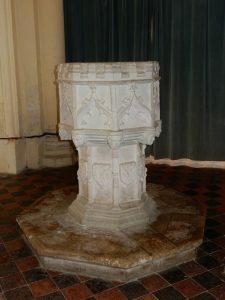 The font is a typical East Anglian octagonal font dating from the C14. 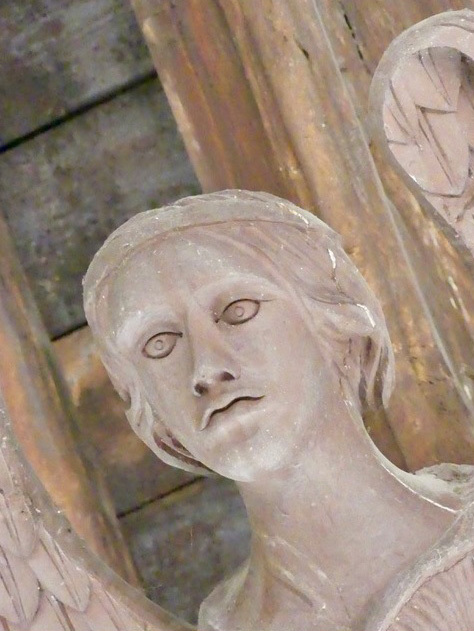 Unfortunately, the carvings been mutilated, possibly during the Civil War period 1642-1651. 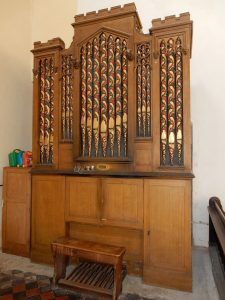 The Organ was built by Bates and Son of Ludgate Hill, London and is probably early to mid C19. 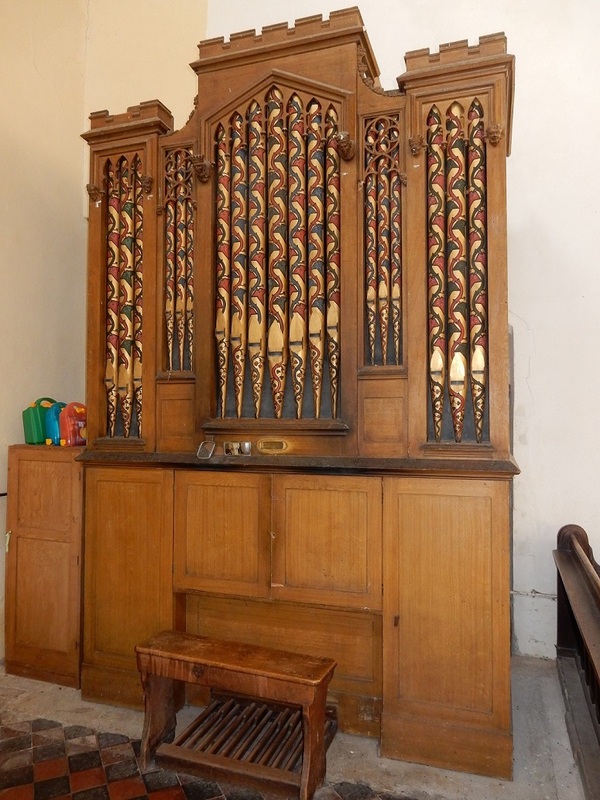 It was awarded a Grade II Historic Organ Certificate in 2007. The Church was extensively remodelled in 1867/8 when many of the remaining medieval details were removed including the Rood Screen and a wall painting of St Christopher “of gigantic size”. All that’s left of the Rood Screen is the tiny staircase and two doors on the south side of The Nave. 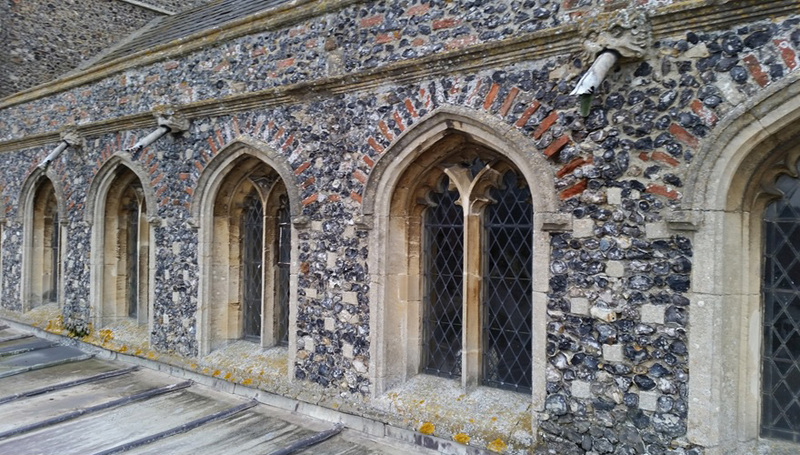 There is almost no medieval stained glass left in the church except a small fragment in the West facing window to the South Aisle. 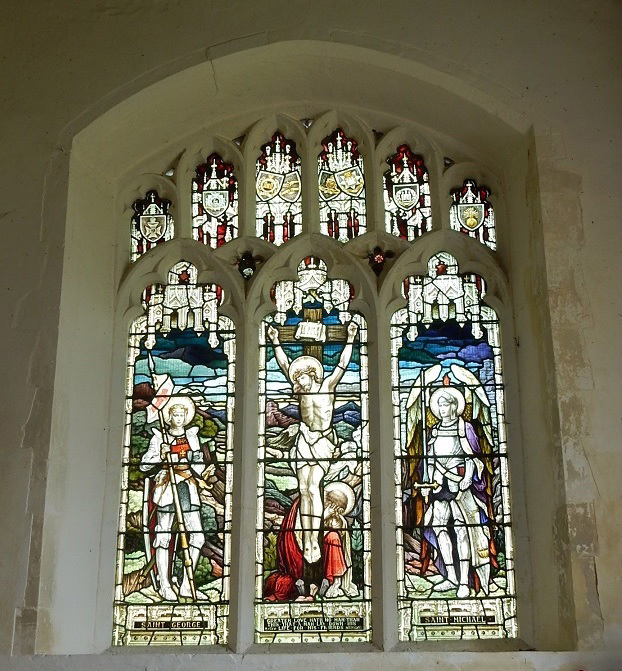 The East facing window in the South Aisle is a War Memorial to the 14 men who lost their lives in the First World War and was erected in 1920. Herbert Gardner, Kings Royal Rifles. Harry W. Symonds, 2nd Suffolks. George S. Buckle, 8th East Surrey. William Nice, 8th East Surrey. William E. Largent, 8th East Surrey. Arthur E. Broughton, Bedfordshire Regt. Leslie H. S. Symonds, Royal Flying Corps. Robert E. Dewing D.S.O., Royal Engineers. Arthur E. Rose, Northampton Regt. Ernest Redit, Royal Garrison Artillery. Frederick A. Wilding, 10th Suffolks. Further research undertaken in 2014/15 confirmed that George Morley, who was a Company Sergeant Major in The Kings (Liverpool Regiment), was killed in July 1916. 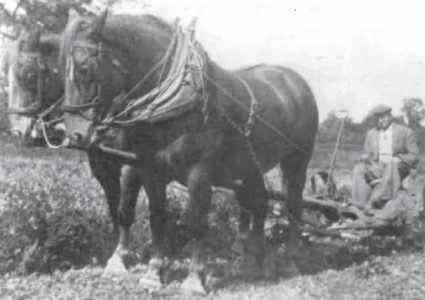 Charles Blackburn – Royal Army Service Corps. In addition to the memorials commemorating the dead of WW1 and WW2, the church contains a number of memorials to past vicars and people of significance who lived in the village. 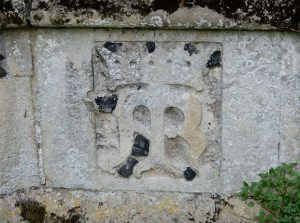 The oldest of these is to William Hovell who died in 1769. You can read about William Hovell’s ancestors and descendants here. The Church was originally dedicated to “All Saints” but in the late C18 /early C19 it was changed (incorrectly) to St. Mary’s. It’s believed that the Victorian historians muddled up Great Ashfield, which was St Mary’s, with Badwell Ash. It’s often said that St. Mary’s is a huge church for so small a village, which is indeed true. 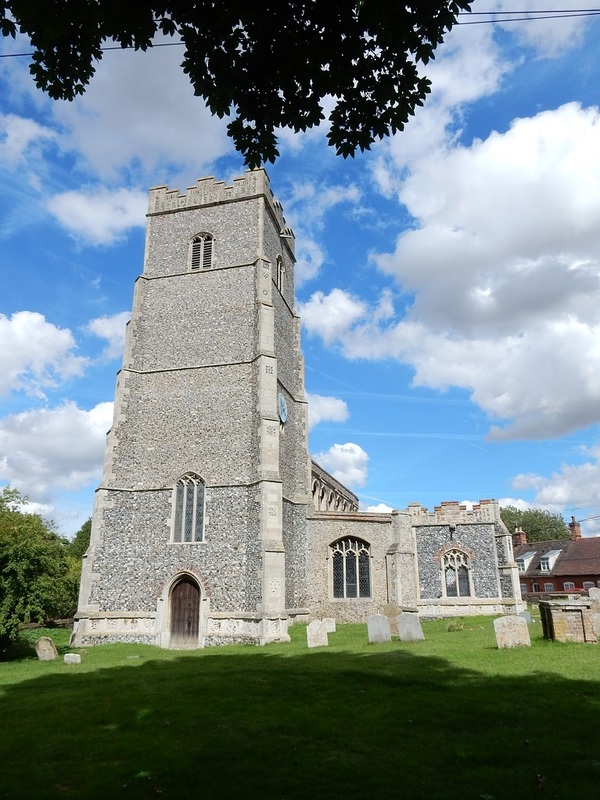 There are 500+ medieval churches in Suffolk which approximates to one church per 225 people in the late C13. 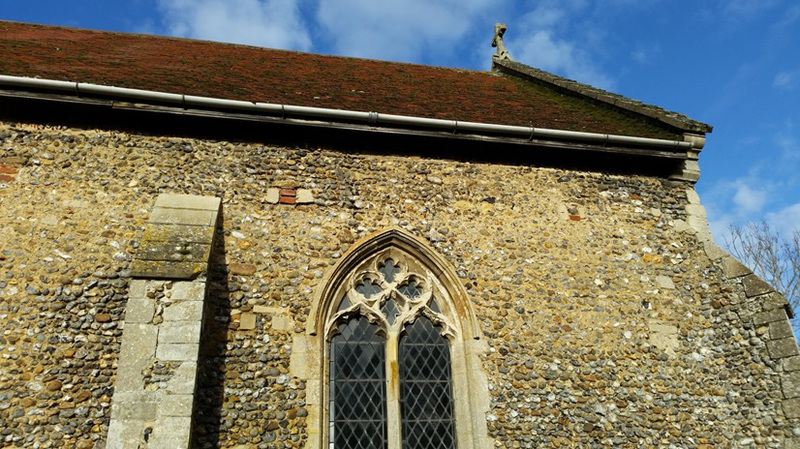 However, it must be remembered that for the first 300 years this was originally a Catholic church and not built for the style of Anglican worship which didn’t occur until the beginning of The Reformation in 1534. The layout would have been completely different with no pews in the Nave which in turn would have been segregated from the Chancel and the priests by The Rood Screen. The Nave would have been laid out with altars and chapels, whilst the celebration of Mass would have been heard, in Latin, in The Chancel.